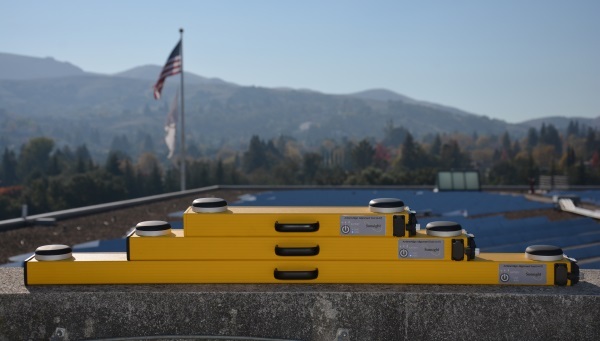 The Sunsight AntennAlign® Alignment Tool (AAT) is the toughest, most accurate antenna alignment tool for cellular panel installation or antenna position audits. It measures antenna alignment in azimuth, tilt, and roll (plumb) while also indicating its height above ground level (AGL) with the Laser Rangefinder Option. The AAT can be used with any WiFi enabled smartphone, tablet, or laptop. 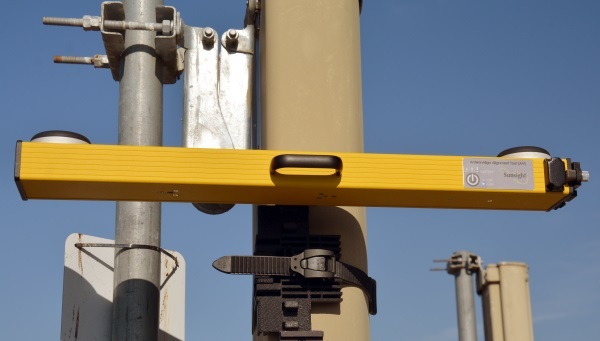 The Sunsight AAT is the only antenna alignment tool accepted by all carriers in all markets in the U.S.
Field Proven Toughness: IP-65 weather resistance (works in rain/snow and desert heat), powder coated aluminum housing, billet aluminum mounting system, no internal moving parts, no built-in display to break. No plastic housing to shatter. Still the lightest and smallest form factor of any alignment tool in the industry (AAT30). State-of-the-Art Technology: no cables, no software, no app, no downloading, and no post processing required. Best Cost of ownership: most features for lowest price. No required annual returns for calibration (end user can calibrate in the field in under two minutes). 3 year manufacturer’s warranty! Best in the industry. Produces PDF and CSV reports for closeout packages that are accepted and required by all carriers.